parents will have to find programs to care for their children. That's what thousands of Hawaii parents will be counting on if a teachers' strike closes the public schools Thursday as expected. Major child-care providers such as the YMCA and Kamaaina Kids are adding all-day programs if there is a strike. But they and other private companies cannot accommodate everyone. There are 183,520 students in public schools statewide, including 104,253 in kindergarten through sixth grade, according to the Department of Education. "There's no system designed to completely replace the public schools," said Kent Keith, vice president for development and communications of the YMCA of Honolulu. "We'll help as many families as we can, but I'm sure a lot of families will be calling on tutu or auntie" or relying on high-school-age siblings to baby-sit. Keith estimated the YMCA could serve about 1,500 kids on Oahu and said reservations remain open. 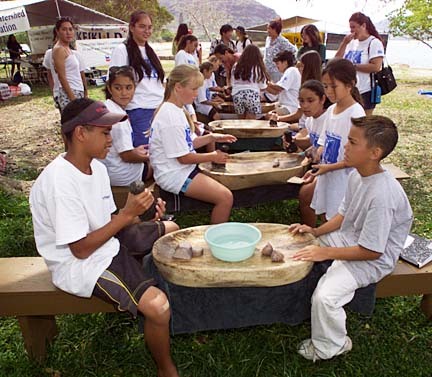 One of its biggest sites, Camp Erdman on Oahu's North Shore, can handle about 200 kids in its planned day camp, said executive director Josh Heimowitz. "We've gotten a lot of phone calls," he said. "My feeling from talking to people is they want to know what's available, but they'll wait until the last minute to sign up." The Honolulu City and County is not planning free child care in public parks, as it did in February 1997 when a teachers' strike was last threatened. That contract dispute was settled the day teachers were poised to walk. Since the strike is supposed to start on a Thursday, parents might take off from work or rely on relatives or friends those first two days, then seek other options if the strike lasts the weekend, predicted Mark Nishiyama, co-founder and chief operating officer of the Kamaaina Kids child-care company. Kamaaina Kids has organized all-day strike care at about 20 off-school sites on Oahu, including the Bishop Museum, Hawaiian Waters Adventure Park and the Sheraton Waikiki Hotel. Pre-registration starts tomorrow. "We just want to be prepared and make sure the parents know there is care out there," said Nishiyama, who estimated the company could serve about 3,000 children. Both Kamaaina Kids and the YMCA are sending fliers home with the kids in their regular after-school programs. The emergency programs will be open to kids in kindergarten through sixth grade on a first-come, first-served basis. Payments will be refunded if the strike is averted. A few YMCA branches are putting together programs for junior high students, but space is limited, said Bobby Stivers, YMCA director of child care. Kids in junior high who should not be home alone all day but for whom there are fewer organized activities are of special concern, said John Friedman, president of the statewide Parent Teacher Student Association. Some neighborhoods are organizing cooperatives with parents planning to take turns staying home from work to supervise several youngsters, while others are relying on churches or community groups, said Friedman, who lives on Kauai and has a daughter in seventh grade. "I think ... it's going to be a challenge to make sure that our young adolescents are in a safe environment," he said. The teachers' union and the state government should "pursue every avenue to settle this dispute," he said. "Strikes hurt everybody, especially our children." Laurie Matsunami is among the parents who will be counting on family help if her children cannot go to school. Matsunami, who works at the Queen's Medical Center, will try to work "flex time," rely on her own mom to watch her children part of each weekday and take a few vacation days if she must. She'll try to avoid sending her two kids to a private provider because many cost about $20 a day per child. "That's $40 a day, and I'm a single parent, so that's kind of hard. But if it drags out, I'd probably have to," said Matsunami, whose children attend Alvah A. Scott Elementary School in Aiea. Matsunami believes teachers deserve a pay raise and said "I don't blame them for going on strike, but I wish both sides could compromise," she said. "And if there is a strike, I hope it's a short one." Here are a few state-licensed facilities on Oahu that are expanding their regular after-school programs to last all day if the threatened teachers' strike closes public schools. Hours: Varies by branch, but generally 6:30 a.m. to 6 p.m. Cost: $20 a day at most branches (does not include transportation or lunch); $30 a day at Camp Erdman on the North Shore, including transportation and lunch. *Some branches aim to provide activities for older children, but space is limited. Locations: About 20 off-campus sites on Oahu. Cost: $20 daily rate, $85 for five days if paid in advance. Also can register beginning tomorrow at company headquarters at 156-C Hamakua Drive in Kailua. Money refunded if strike does not occur. **If there is a strike, parents can register directly at the strike care sites if space remains available. Location: 2535 S. King St. Location: Charles C. Spalding Clubhouse, 1704 Waiola St. Hours: 8 a.m. to 6 p.m. Cost: Regular membership dues of $10 a year; no additional charge for strike program. Reservations: Can come the day of the strike.